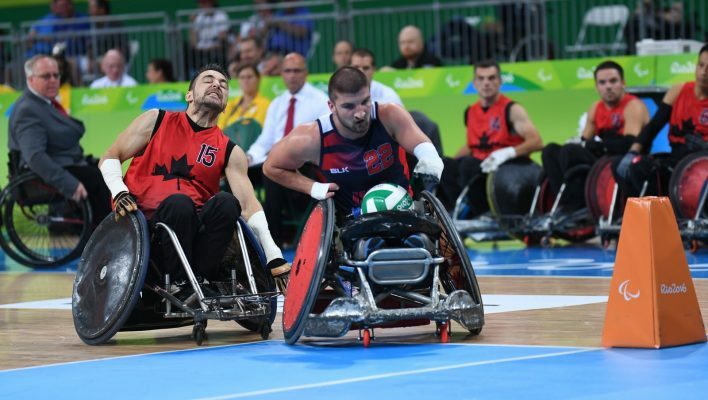 Rio De Janerio, BRAZIL – There are storied rivalries in sport and in wheelchair rugby its’ the U.S. and Canada. The two have played each other on dozens of stages with the outcomes going back and forth but today was the U.S.’s day, winning the 2016 Paralympic semi final 60-55 over the Canadians. The win puts the U.S. through to the gold medal match on Sunday at 11:30 ET. The match up between the two nations was physical from the start. Chuck Aoki (Minneapolis, MN) took the first score of the game from the tip off and things remained evenly paced for the first five minutes. A missed long court pass from Canada at 3.05 was the turnover that allowed the U.S. to take the lead, 10-8. With a strong defensive effort throughout the period it was 14-13 in the United States’ favor at the end of one. Canada took possession of the ball to kick off the second and tied it up at 14 but the score was quickly answered by the United States. Successive turnovers by the Canadians allowed the Americans to go up by four with five minutes left in the half. A missed pass by the U.S. a 3.45 put Canada in position to shrink the margin back to two but key defense by the U.S. with just two minutes left in the period allowed them to notch back up the lead again. At the end of the first half it was the U.S. 29 , Canada 26. Both teams played aggressive defense in the opening minutes of third with the ball carriers for each squad working hard to move and protect the ball down the court. Aoki capitalized on a missed inbound pass by the Canadians at 2.41 and brought the margin back up to four. The period ended with the U.S. 43, Canada 39. Never to be counted out, Canada has finished each match in strong fashion at these Games but, another missed inbound pass from the Canadians at 6.39 and the U.S. would again look to Aoki, who scored to bring the U.S. up by five. Just when that looked to be their biggest lead, a turnover by Canada at 6.15 and a strategic inbound pass from Eric Newby (Littleton, CO) to Josh Wheeler (San Tan Valley, AZ) brought the Americans up by six, 48-42. Canada would fight to keep it close but in the end it was the U.S. 60, Canada 55. Top scorers for the U.S. was Chuck Aoki with 34, Josh Wheeler with 11 and Kory Puderbaugh (San Diego, CA) with 9. The U.S. will face the winner of Saturday’s semi final number two between Australia and Japan. The gold medal match is scheduled for 11:30 ET Sunday, the final day of competition at these Games. Team USA is now 27-2 in Paralympic Competition having been on the podium in every Games since the introduction of the sport at Sydney 2000 with two golds (Sydney 2000 and Beijing 2008) and two bronze (Athens 2004 and London 2012). The United States regained their title as the number one team in the world at the recent 2016 Canada Cup.